July is the 7th month of the year in the Gregorian calendar, coming between June and August. It has 31 days. July was named after Julius Caesar. The mid-way point of the year is either on July 2 or in the night of July 1-2. July always begins on the same day of the week as April, and additionally, January in leap years. July doesn't end on the same day of the week as any other month in common years, but ends on the same day of the week as January in leap years. In each hemisphere, it is the seasonal equivalent of January in the other hemisphere. In the North, it is summer and in the South it is winter. In the Northern Hemisphere, July is often the warmest month of the year, and major sporting events and music festivals are held around this time. In the Southern Hemisphere, it is a winter month, with the coldest-recorded temperature having been measured in Antarctica in this month. July begins on the same day of the week as April every year and on the same day of the week as January in leap years. No other month in common years ends on the same day of the week as July, but July ends on the same day of the week as January in leap years. In common years, July starts on the same day of the week as October of the previous year, and in leap years, May of the previous year. In common years, July finishes on the same day of the week as February and October of the previous year, and in leap years, May of the previous year. In common years immediately after other common years, July both starts and finishes on the same day of the week as January of the previous year. In years immediately before common years, July starts on the same day of the week as September and December of the following year, and in years immediately before leap years, June of the following year. In years immediately before common years, July finishes on the same day of the week as April and December of the following year, and in years immediately before leap years, September of the following year. July's flower is a variety of the water lily. Its birthstone is the ruby. The meaning for the birthstone ruby is contented mind. Astrological signs for July are Cancer (June 21 - July 21) and Leo (July 22 - August 21). In the old Roman calendar, July was called Quintilis, meaning Fifth Month because, in the old calendar, the year began in March. Augustus later renamed it July in honour of Julius Caesar, whose birthday was in this month. Augustus later also named the following month, August, after himself. 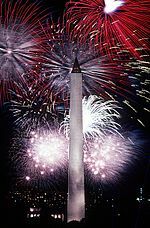 July 4 – Independence Day in the United States, commemorating the Declaration of Independence. July 6-14 – San Fermin festival and bull run in Pamplona, Spain. Machu Picchu, Peru, which was "re-discovered" on July 24, 1911. July 1 – 1863: American Civil War: The Battle of Gettysburg is fought until July 3. July 1 – 1867: The Canadian Confederation is founded. July 1 – 1937: The 999 emergency dialing service begins in the UK. July 1 – 1997: The United Kingdom hands control of Hong Kong back to China. July 1 – 1999: The new Scottish Parliament is opened in Edinburgh. July 1 – 2013: Croatia joins the European Union. July 2 – 1937: Amelia Earhart goes missing. July 3 – 1844: The Great Auk becomes extinct, after the last group were killed in Iceland. July 4 – 1776: 13 colonies on the East coast of North America issue the Declaration of Independence, now celebrated on this date in the United States. July 4 – 1826: US Presidents John Adams and Thomas Jefferson die on the same day as each other. July 4 – 2012: Scientists at CERN announce the discovery of a particle with properties consistent with the Higgs boson, after experiments at the Large Hadron Collider. July 5 – 1811: Venezuela declares independence. July 5 – 1962: Algeria becomes independent. July 5 – 1975: Cape Verde becomes independent. July 6 – 1964: Malawi becomes independent. July 6 – 1975: The Comoros become independent. July 7 – 1937: The Second Sino-Japanese War begins. July 7 – 1978: The Solomon Islands become independent. July 7 – 2005: Islamic extremists detonate explosives at tube stations around London and on a bus, killing 52 people. July 9 – 1816: The United Provinces of Rio de la Plata declare independence, as the predecessor state of present-day Argentina. July 9 – 2011: South Sudan becomes independent from Sudan, after a referendum six months earlier. July 10 – 1913: At nearly 57 degrees Celsius, the hottest-recorded temperature on Earth, is measured in Death Valley, California. July 10 – 1973: The Bahamas become independent from the UK. July 10 – 1985: French agents torpedo the Rainbow Warrior vessel docked in Auckland harbour, New Zealand, where activists on board were protesting against French nuclear tests. July 11 – 1960: The novel To Kill a Mockingbird by Harper Lee is first published. July 11 – 1995: The worst massacre in post-World War II Europe occurs at Srebrenica, at the height of the Balkan War. July 11 – 2010: Spain wins the 2010 FIFA World Cup against the Netherlands after a bad-tempered match. July 12 or 13 – 100 BC: Julius Caesar is born. July 12 – 1561: St. Basil's Cathedral in Moscow is consecrated. July 13 – 1930: The 1930 FIFA World Cup in Uruguay begins. July 14 – 1789: The Bastille prison is stormed in Paris, starting the French Revolution. July 16 – 1950: Uruguay wins its second FIFA World Cup, defeating host nation Brazil in the final. July 17 – 1918: The family of Tsar Nicholas II is executed by the Bolsheviks in Russia. July 17 – 1936: The Spanish Civil War begins. July 19 – 1903: Maurice Garin wins the first Tour de France. July 20 – 1810: Bogota, New Granada (now Colombia) declares independence from Spain. July 20 – 1969: Neil Armstrong becomes the first person to walk on the Moon, followed shortly after by Buzz Aldrin. July 21 – 1983: At -89.2 degrees Celsius, the coldest-ever recorded temperature is measured in Antarctica. July 21 – 2011: End of the Space Shuttle programme. July 22 – 2009: Solar eclipse over Asia and the Pacific Ocean. July 22 – 2011: The 2011 Norway attacks occur, as Anders Behring Breivik kills a total of 77 people in two separate attacks. July 23 – 1952: The Egyptian monarchy is removed from power in a coup. July 24 – 1911: Explorer Hiram Bingham re-discovers the remains of Machu Picchu in Peru. July 25 – 1978: Louise Brown, the first 'test-tube baby', is born in the UK. July 26 – 1847: Liberia declares independence. July 26 – 1965: The Maldives declare independence. July 27 – 1940: Cartoon character Bugs Bunny makes his first appearance. July 27 – 1953: The Korean War ends, though an official state of war still exists between North Korea and South Korea. July 28 – 1821: Peru declares independence. July 28 – 1914: World War I - Austria-Hungary declares war on Serbia. July 28 – 1976: Tangshan, China, is struck by a huge earthquake, killing many thousands of people. July 29 – 1900: King Umberto I of Italy is assassinated by Gaetano Bresci. July 30 – 1930: Uruguay wins the first FIFA World Cup, defeating Argentina in the final in Montevideo. July 30 – 1980: The New Hebrides, changing their name to Vanuatu, become independent. July 30 – 2012: A massive power blackout affects around 620 million people in Northern India. July 31 – 1790: The first US patent is given to Samuel Hopkins for a potash process. A summer beach in the Northern Hemisphere. The hottest and coldest-ever recorded temperatures on Earth were both recorded in July. The months of June and July both start with the "Ju" letter combination in the English language and in some languages have only one letter's difference between their names. July and August are the only months named after people who really lived (Julius Caesar and Augustus respectively). July 1 is the only day in July that is entirely within the first half of the calendar year. Canada, the United States and France are among the countries that celebrate their national holidays in July. The astrological signs for July are Cancer (June 21 to July 21) and Leo (July 22 to August 21). This page was last changed on 6 May 2018, at 03:04.